Paul gives a final polish to George Sholto from Penrhyn slate quarry as it reaches working steam pressure during our last visit, having helped other members prepare the loco from cold. Having been to Bressingham Steam Museum in 2016 and had a thoroughly enjoyable day, we booked again this year to go on the 2nd April, but all the places were reserved in just over a day! As the day was oversubscribed we're now going for a second driving experience day on 11th June. The day will start 7.30 - 8.00am with engine preparation, unlike the other railways we go to, you're expected to get grubby with lots and lots of hands on. 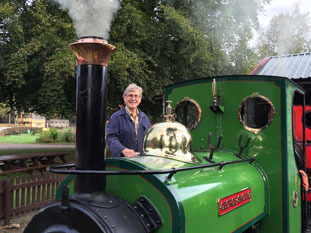 They're putting five engines in steam for us and during the day you will get 3 driving turns, two on the Fen Railway, and one on Standard Gauge track. The day will finish 4.30 - 5.00pm with engine disposal - more getting grubby! There is also the option of a forth driving turn on St Christopher, available to 16 of the 24 people attending. There is plenty to see at the museum, plus you can ride behind the various locos in steam if you wish. Standard gauge track: The LB&SCR Martello built in 1875 and restored to working condition just before our last visit. Bressingham have given us an exceptionally good deal. Name and Address and the number of members and non member tickets or guests required. This is so that we can work out why we got the money and who from! You need to be aged 18 or over, and be able to climb a vertical ladder from the footplate of Martello, in case of an emergency.